Basalt stone fountain rock garden - Universal Landscape, Inc. 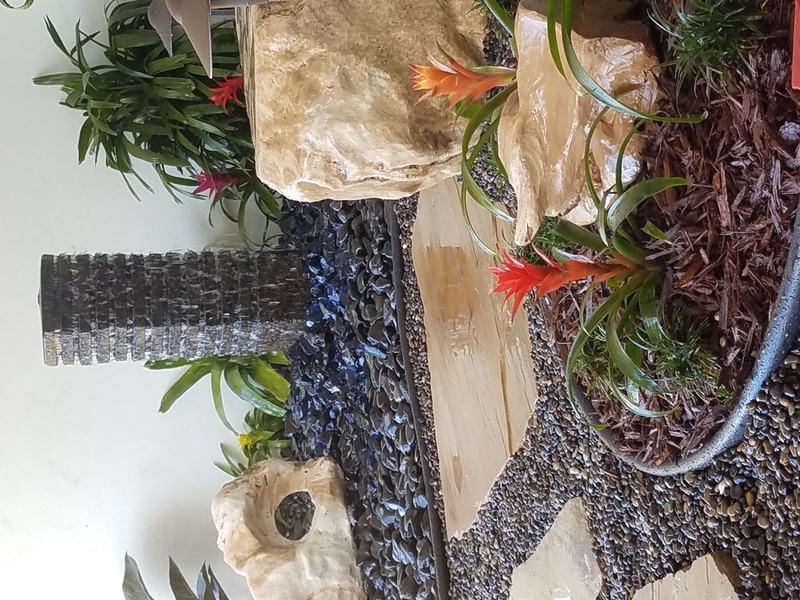 This Basalt Stone Fountain rock garden accents the entry & covered patio area of the east Delray Beach home. With a home set on the water in the backyard, this entire property has a relaxed feel, both inside & outside. The homeowner wished for something unique in the small area by the front door. There was a small brick border that was a 4′ width that ran the entire covered area. This brick was removed to open up an area approximately 8′ wide under the covered roof of this entry area. The sound of water was added with this focal point Basalt column fountain to add a soft, relaxing sound. Nestled in a bed of Dark Blue Glass with polished Black stone, the fountain operates as a pond less feature. To note, with pondless features, the water is submerged below grade in a bed of stone. The stone allows the ability to have a firm surface, but the basin is filled with stone & water so the feature can operate. This feature is plugged into the wall behind the feature. In addition, a polished Onyx stone bench offers a place to sit as well as a focal accent & point of destination in this miniature garden. Two smaller Onyx stones adorn the view and help to create a sense of depth to the small area, with the larger Onyx stone in the background, the one with the natural whole in the stone. This is set into a path of a Mixed Mexican Beach Chattahoochee stone with varied colors at approx. 1/4″ size with Tennessee Crab Orchard Stepping stones as a contrast to the darker stone as well as serving a functional use in a miniature path to the Onyx bench Boulder. To accent at night, both spot lights and pathway lights were used and are nestled into the planting beds amongst Bromeliad ‘Blue Tango’ & ‘Guzmania’s’ , Dwarf Mondo Grass, Gold Sedum, Baby Sunrose Sedum, Lady Palm & Rojo Congo Philodendron in the backdrop. To view more photos of the transformation of this entry garden area, please view the progression photos in our website. We hope you like & if you are looking for a large project or even a miniature garden such as this, we hope you’ll keep Universal Landscape, Inc. in mind !